Mayor Dave Says Support Your Local Market! 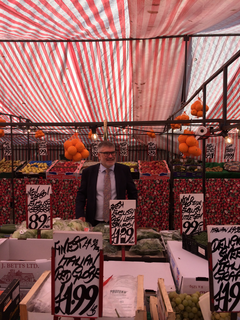 Mayor Dave Hodgson has issued a rallying cry in support of local markets, in the week that his Executive agreed a freeze in the cost of pitches in support of local market traders. Markets provide important additional footfall at a time when town centres across the country are facing major challenges, and they are an important and historic feature of Bedford. In support of the Bedford Charter Market and Kempston Market, Mayor Dave Hodgson's Excecutive this week agreed an inflation-defying freeze for pitch hire in 2019, cutting real costs for traders. Commenting on market day on Wednesday this week on his Facebook page, Mayor Dave Hodgson said: "It's been another bright and sunny market day in Bedford today, and when I popped along to St Paul's Square recently to check out the improvements we're carrying out, I had a look round the charter market and chatted to some of the traders. The market was absolutely buzzing with activity, and the fresh produce looked even more colourful and inviting than usual in the bright sunshine. If you've not been lately, I strongly recommend that you pay a visit if you can and support your local markets. Bedford Charter Market takes place on Wednesdays and Saturdays, Kempston Market is on Thursdays and there are a number of specialist markets in Bedford during the week. For more details, see https://www.bedford.gov.uk/business/markets.aspx"